Scanned image of interior, upper level. Detail of lantern prisms and upper balcony detail. 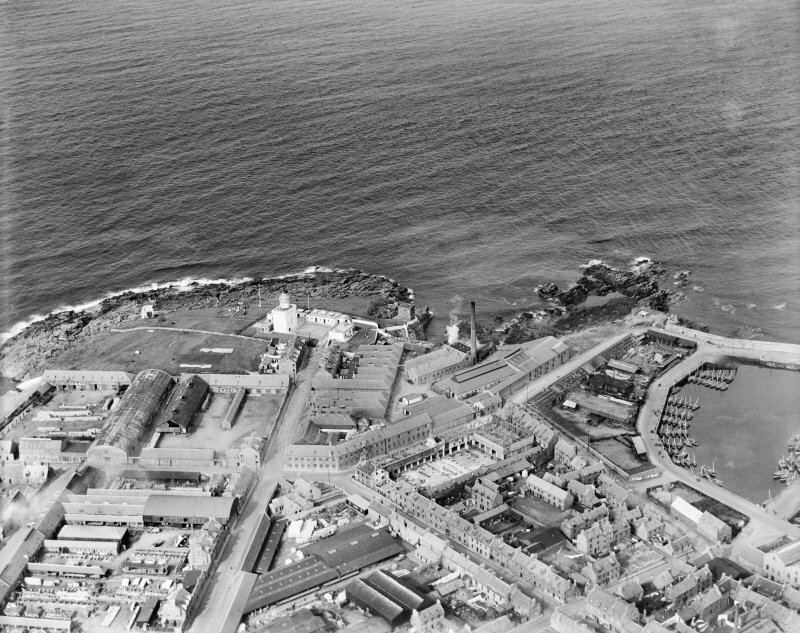 Fraserburgh, general view, showing Kinnaird Head Lighthouse and Denmark Street. Oblique aerial photograph taken facing south-west. 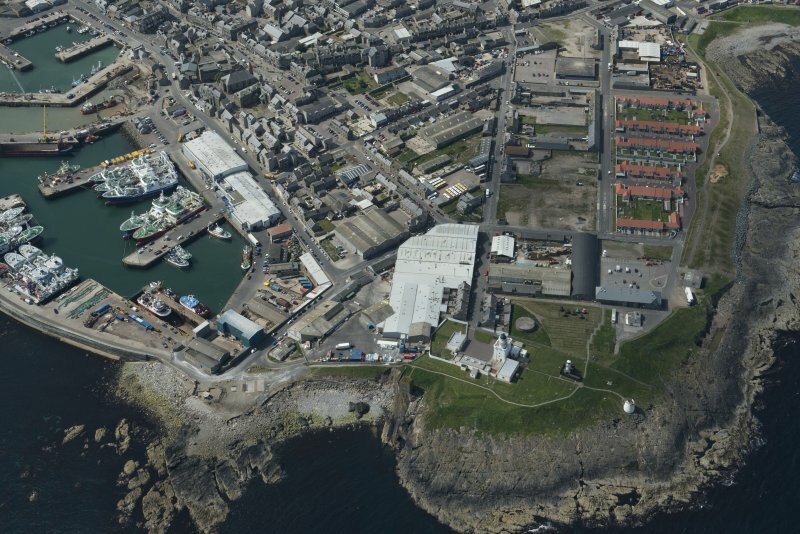 Fraserburgh, general view, showing Kinnaird Head Lighthouse and Bath Street. Oblique aerial photograph taken facing north-east. Scanned image of general view from North-East. Kinnairds Head Lighthouse Fraserburgh, Aberdeenshire, Scotland. Oblique aerial photograph taken facing South/West. 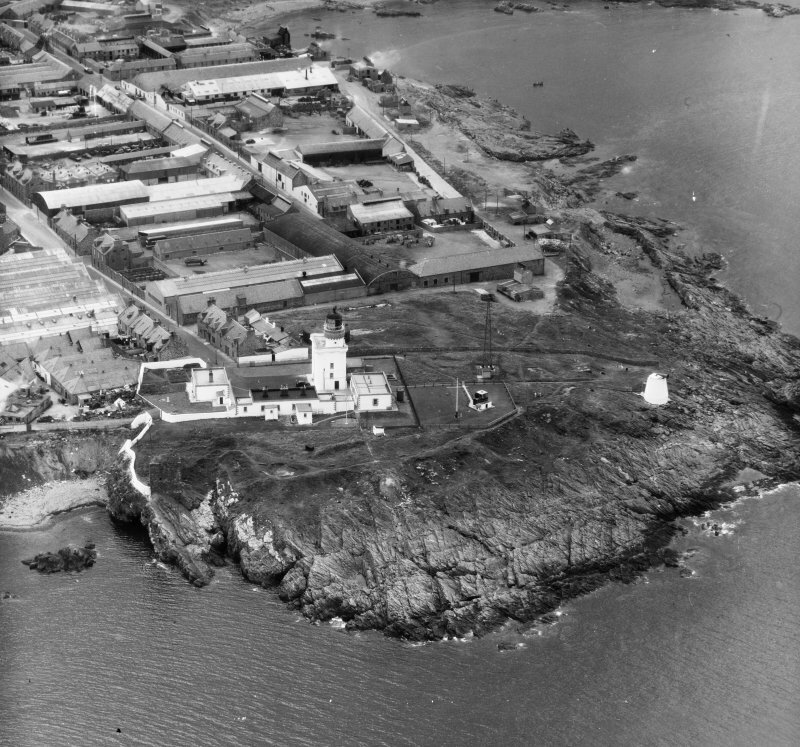 Oblique aerial view centred on the lighthouse and museum with the remains of the tower adjacent, taken from the E.
Aquatint view of the castle in a storm. 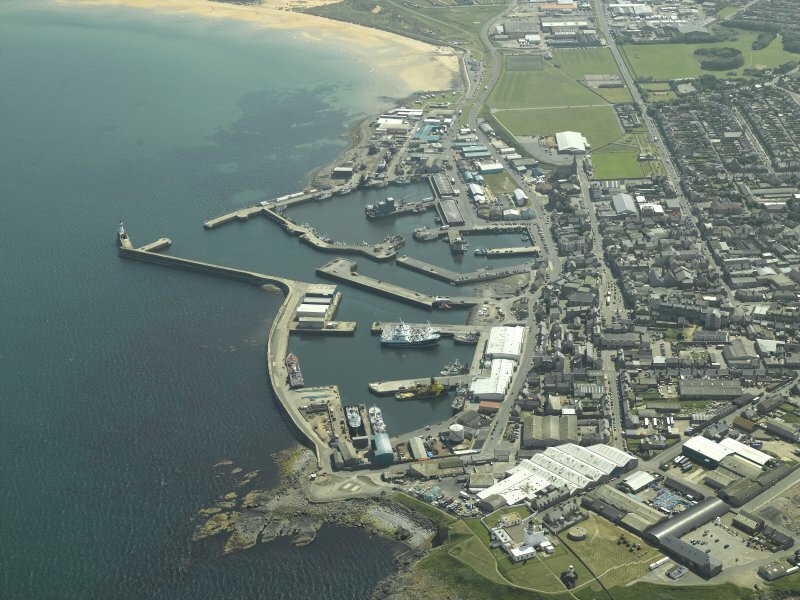 Oblique aerial view of Fraserburgh, Fraserburgh Harbour, Kinnaird Lighthouse and New Lighthouse, looking SW.
General oblique aerial view centred on the harbour with the lighthouse and remains of the tower in the foreground, taken from the NW. 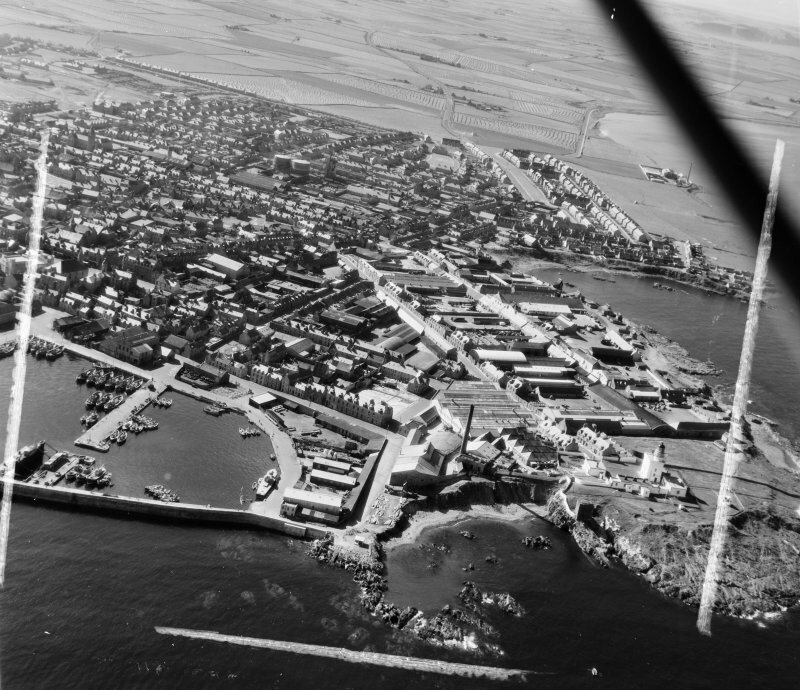 General oblique aerial view centred on the harbour with the lighthouse and remains of the tower in the foreground, taken from the N.
General view from W-N-W also showing modern light. 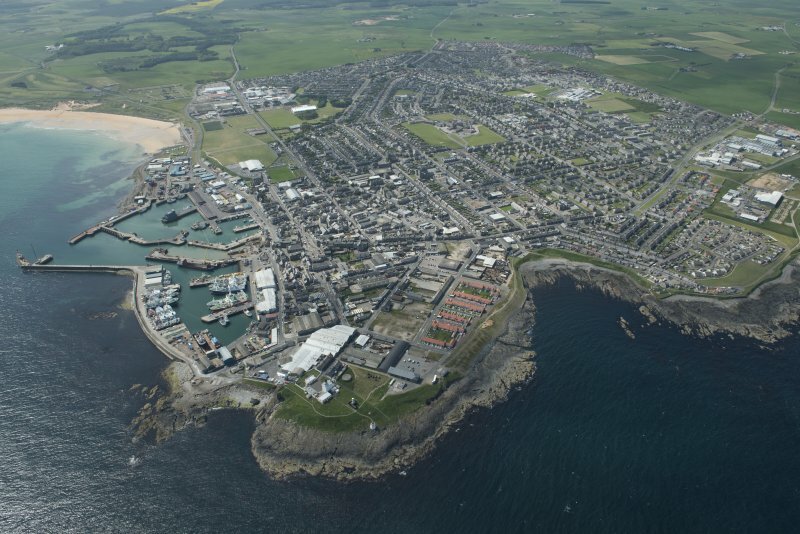 General View Fraserburgh, Aberdeenshire, Scotland. Oblique aerial photograph taken facing South/West. This image was marked by AeroPictorial Ltd for photo editing. 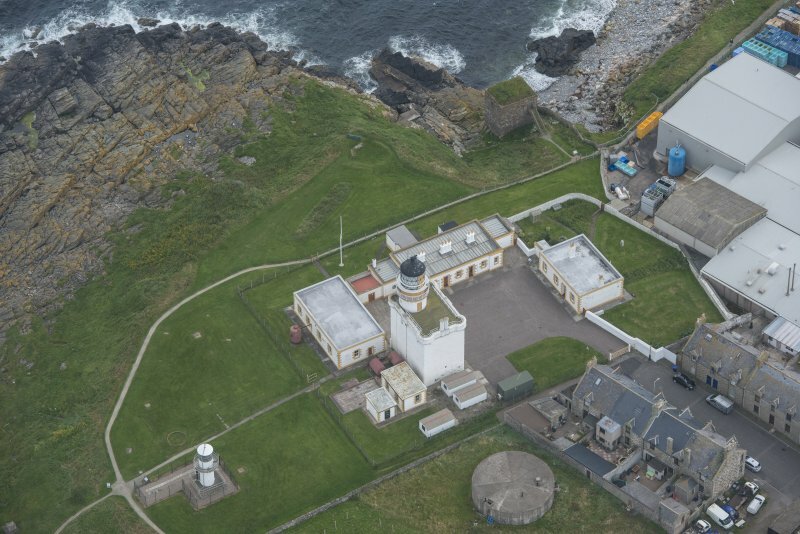 Oblique aerial view of Kinnaird Lighthouse and New Lighthouse, looking SW. 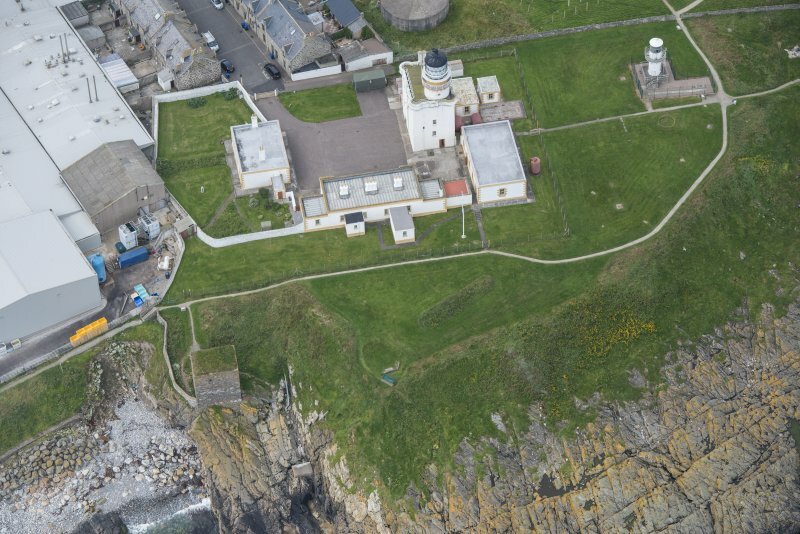 The lighthouse on Kinnaird Head was built on the site of the 16th century Kinnaird Castle by the engineer Thomas Smith. 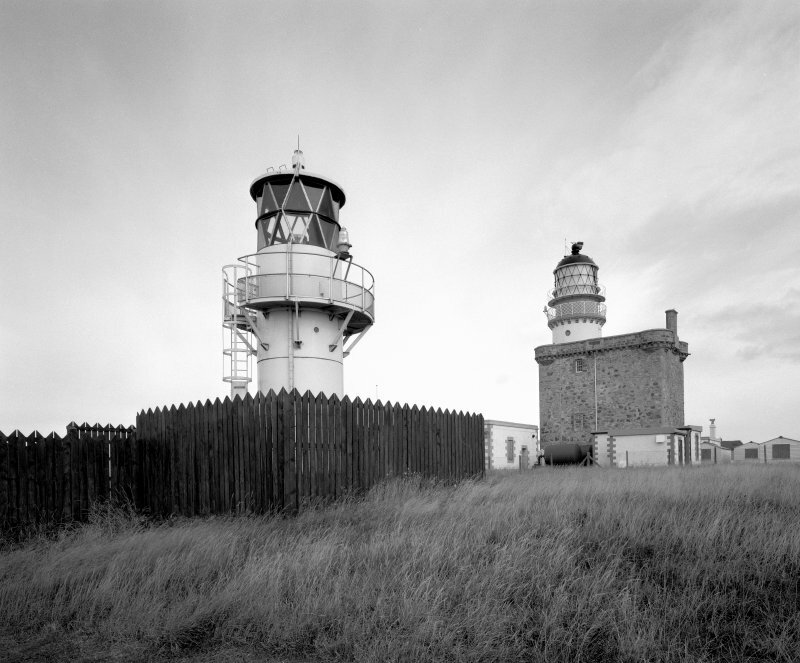 When lit on 1st December 1787, it was the first lighthouse in northern Scotland. The lantern chamber is located at the top of the four-storey structure, and the bank of whale-oil lamps it contained were visible for up to fourteen miles. The lighthouse has been superseded by an automatic light which operates beside the original structure. 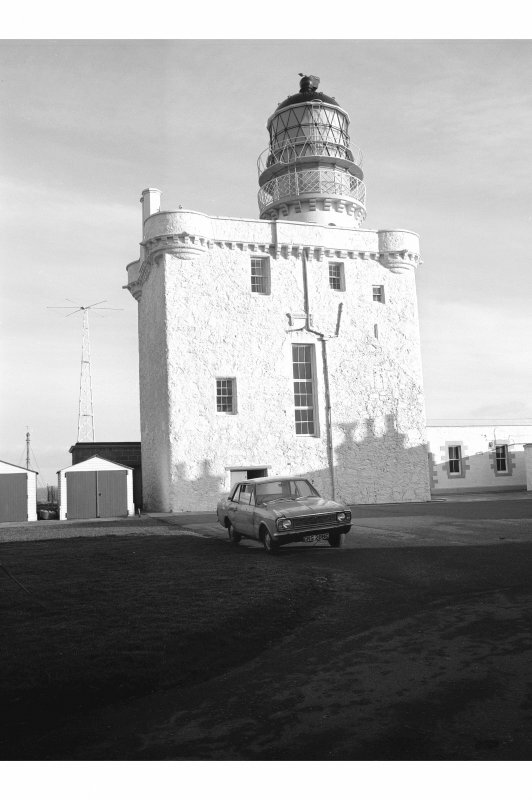 It is now open to the public as part of the Museum of Scottish Lighthouses. OS 25" map, Aberdeenshire, 1st ed., (1869). See also NJ96NE 12 and NK06NW 3.00. For nearby Wine Tower (NJ 99937 67510), see NJ96NE 9. For (present and successor) New Lighthouse (at NJ 99837 67567), see NJ96NE 7.01. Source: Mr R Q C Stevenson, 18 Mortonhall Road, Edinburgh 9. Upper half of sheet. Plan and elevation. Pen and grey wash with black shading showing the old castle. Lower half of sheet. A plan of Kinnaird's Head Castle by Will Urquhart Octr 1786. Pen and ink and grey wash for castle. 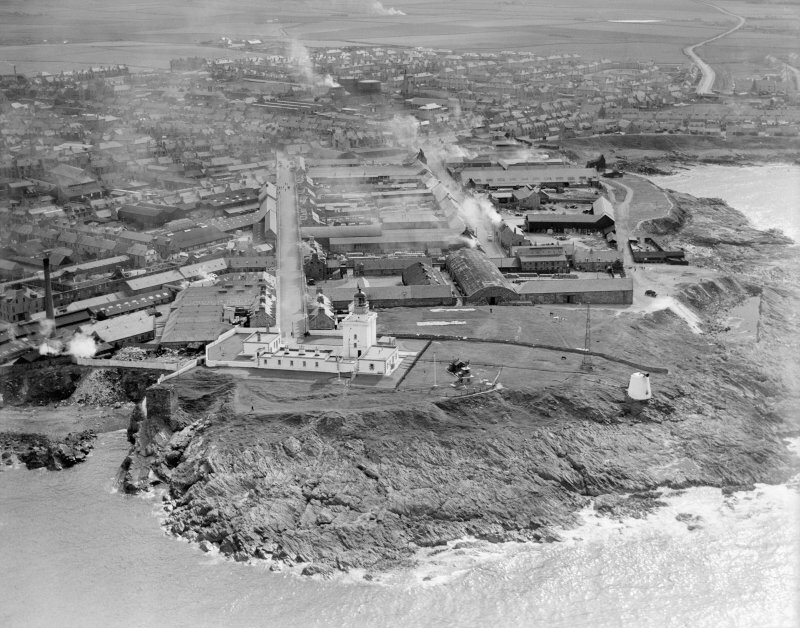 Also shows old tower on coast. 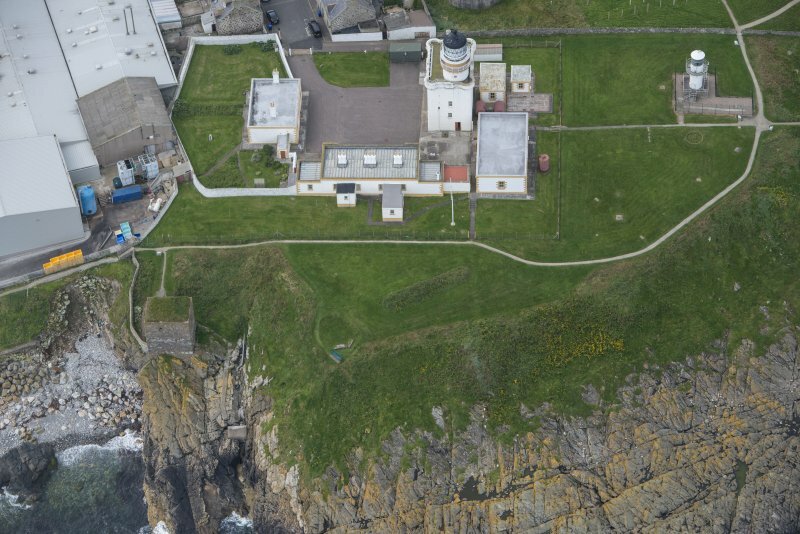 Kinnaird Head Castle, founded on the 6th of March, 1570, measures 39ft by 27ft and is 60ft high. It was leased, c.1787, to the Northern Lighthouse Company by whom it has been much altered although it still retains a good corbelled course with round projecting bartizans at the angles and square ones in the faces. OSA 1793; J B Pratt 1858; D MacGibbon and T Ross 1887- 92; W D Simpson 1940; W D Simpson 1951; Saltoun 1963. Kinnaird Head Castle is as described above. Visited by OS (NKB), 16 January 1969. (Location cited as NJ 999 677). Built 1786-7, engineer Thomas Smith. A short circular tower, with a triangular-paned lantern with a domed top, rising from a square tower with corner circular turrets, formerly a tower house. There are the usual flat-roofed, single-storey keepers' houses. The oldest lighthouse in the north of Scotland. This lighthouse was first lit on 1st December 1787 as the first of the Northern Lighthouse Board, and, as such (according to Robert Stevenson) was largely of timber construction (apart from cast iron window-sash frames, copper sheeting in the wooden cupola, and fireproof plates of tinned iron and ceilings and floors); these early lights were built to be as small, plain and simple as possible, and only fixed oil lights were shown. 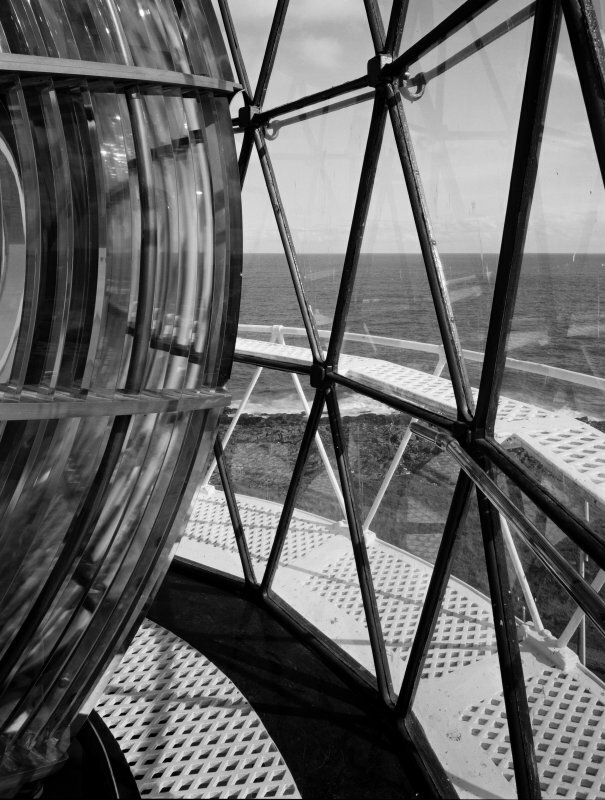 The lighthouse was rebuilt between 1821 and 1830 (together with others from among the early lights) into a more permanent form and to conform with the Commission's 'national establishment' policy; it was lighted with a dioptric or catadioptric system from 1851. 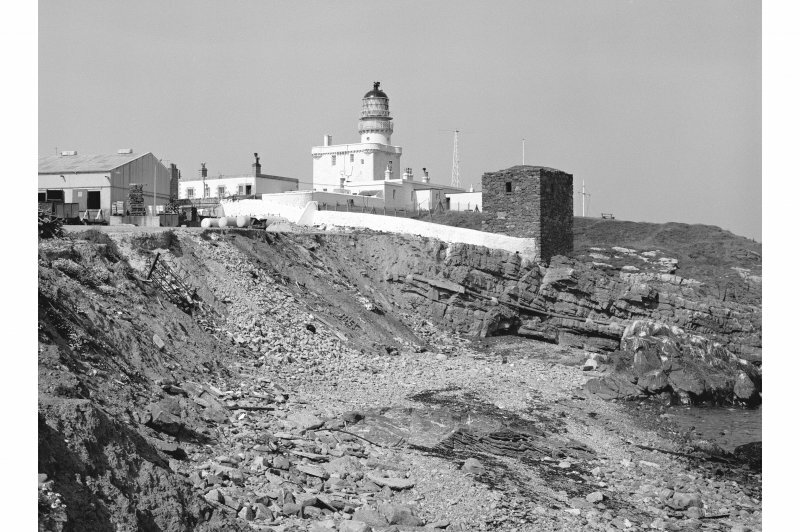 A permanent radio beacon was installed in 1929 and the lighthouse was attacked by German aircraft in 1941. 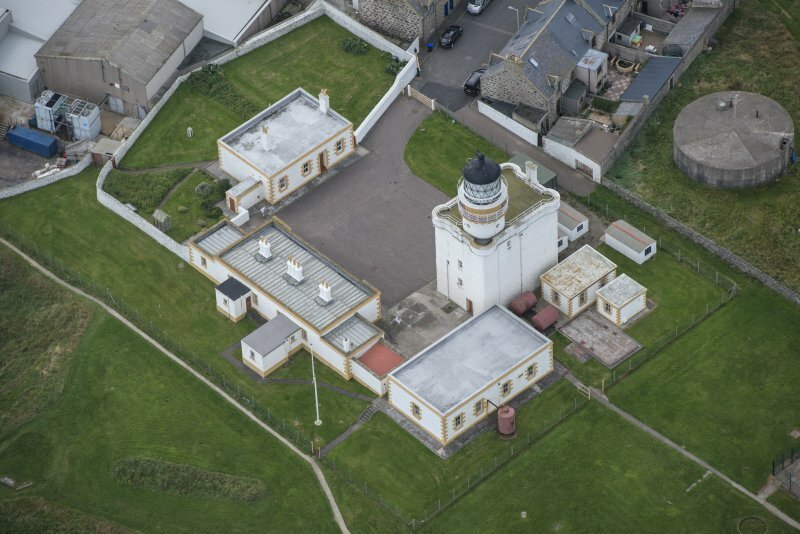 Kinnaird Head Lighthouse is now open to the public as Scotland's Lighthouse Museum. Information from RCAHMS (RJCM), 16 September 1997. NJ 998 675 Four weeks of excavations were carried out in the basement during 1997 and 1998, with the objective of revealing the primary mid-16th-century floor surfaces and elucidating the architectural sequence. The construction, inside the castle, of the first lighthouse in northern Scotland in the 1820s by Robert Stevenson had severely truncated the medieval deposits. However, remnants of the primary occupation surfaces were revealed in all rooms of the basement, although it appears the majority of occupation-derived debris has been removed, probably during the conversion of the castle to a lighthouse. Very few artefacts were recovered from the medieval deposits, although a 1612 twopence and a bone-handled iron awl were recovered from an early pit. Animal and fish bone predominates, supporting the use of the western vault as a kitchen. The arrangement of the basement has been altered on several occasions during its use. The lighthouse builders removed the southern part of the eastern vault and the original staircase to the first floor alongside the S wall. It appears the spiral staircase to the first floor is a later insertion, and it is also of note that this stair is not on the same alignment as the spiral stair in the upper storeys. A small lobby at the base of the original staircase, which ran down to the western vault, originally provided access to the eastern vault. This doorway was blocked by the lighthouse builders, as was another doorway between the E and W vaults, although the second opening was not in itself an original feature. The surviving archaeological deposits give a clear picture of the sequence of architectural alterations, but unfortunately very little pottery was found to date these events. OS (GIS) MasterMap, January 2011. In 1991, this lighthouse was superseded by the New Lighthouse (NJ96NE 7.01), 50m to the NNW. 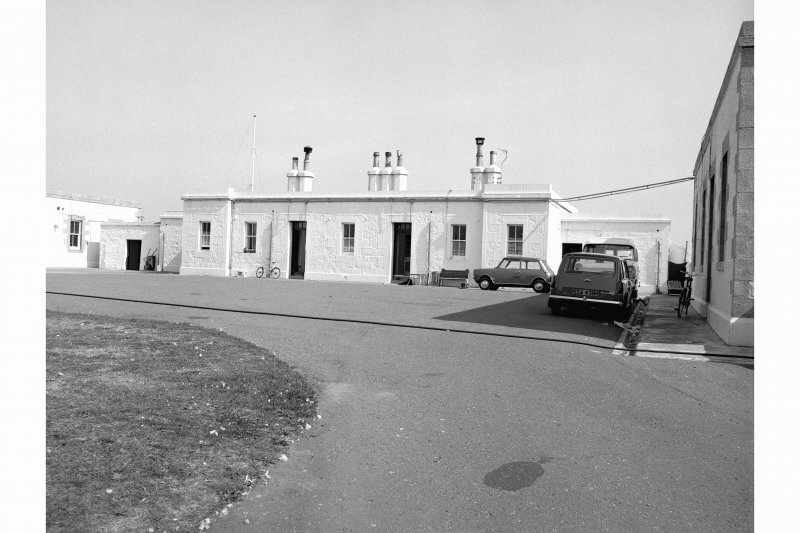 It was then re-opened as the Museum of Scottish Lighthouses. Information from Virginia Mayes-Wright (Director, Museum of Scottish Lighthouses), 25 January 2011. 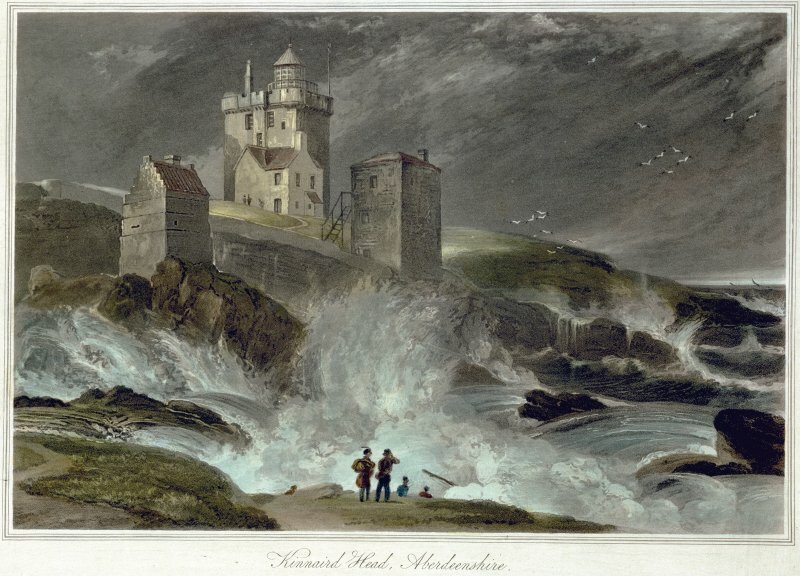 Kinnaird Head Castle is as described. Visited by OS (NKB) 16 January 1969. 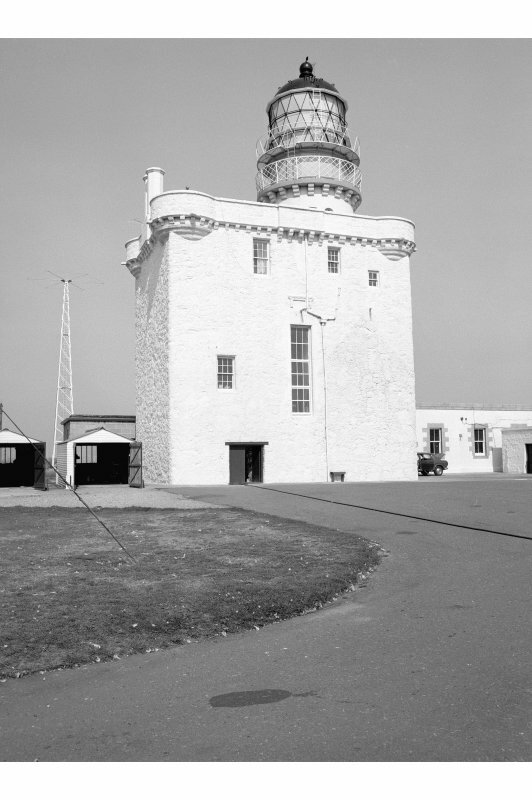 One of the fIrst tasks of the Commissioners appointed under the act of 1786 ... for erecting Certain Lighthouses in the Northern Part of Great Britain was to seek a site on the most northerly part of Aberdeenshire, the north-east corner of the mainland. The tower-house built in the 16th century by Sir Alexander Fraser, eighth laird of Philorth, proved to be in an ideal spot and to provide a ready made elevated platform, four storeys high. 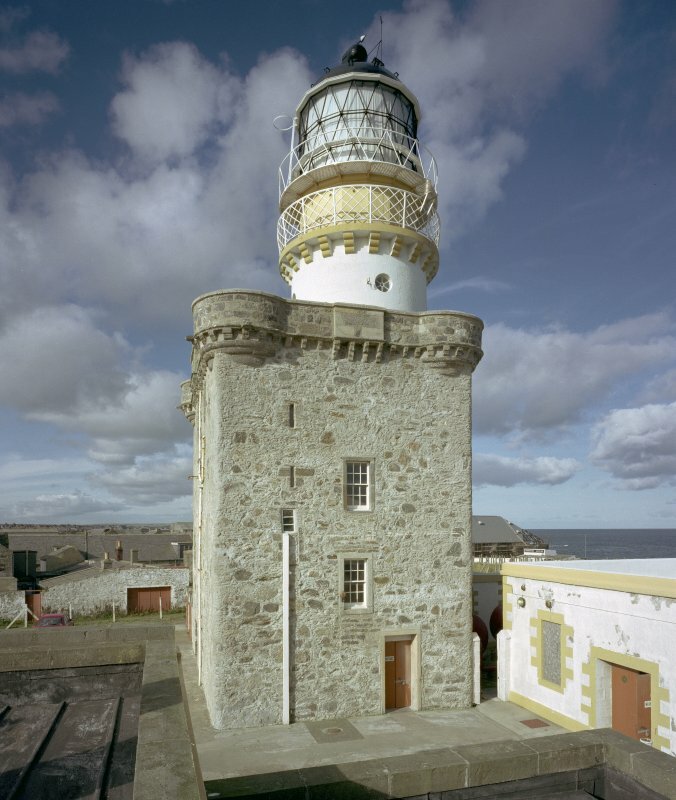 By converting the cap-house of the turnpike stair the engineer Thomas Smith achieved a simple lantern chamber which was first lit on 1 December 1787, thereby becoming the first lighthouse in northern Scotland. Originally the light was fixed, coming from banks of whale-oil lamps each with its own mosaic of mirror glass behind; in clear weather that light could be seen from 12 or 14 miles away. The lantern was rebuilt and upgraded in the 1820s and again in 1851. It now comprises a short circular tower with a domed lantern set with triangular panes of glass. The first permanent radio beacon was established here in 1929. The usual flat-roofed, white-washed keepers' houses and stores form a small but windy courtyard at the base of the tower. Above the rocks 100m to the east is another 16th century tower, the Wine Tower. Although now truncated, it contains one chamber with important heraldic bosses which are paralleled at Crathes (no. 22). 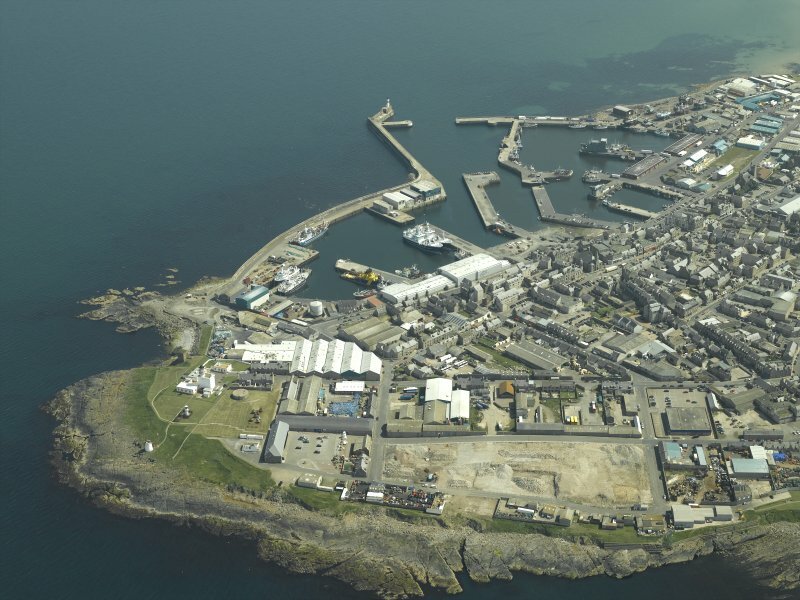 One of the first tasks of the Commissioners appointed under the act of 1786... for erecting Certain Light-houses in the Northern Part of Great Britain was to seek a site on the most northerly part of Aberdeenshire, the north-east corner of the mainland. The tower-house built in the 16th century by Sir Alexander Fraser, eighth laird of Philorth, proved to be in an ideal spot and to provide a ready made elevated platform, four storeys high. 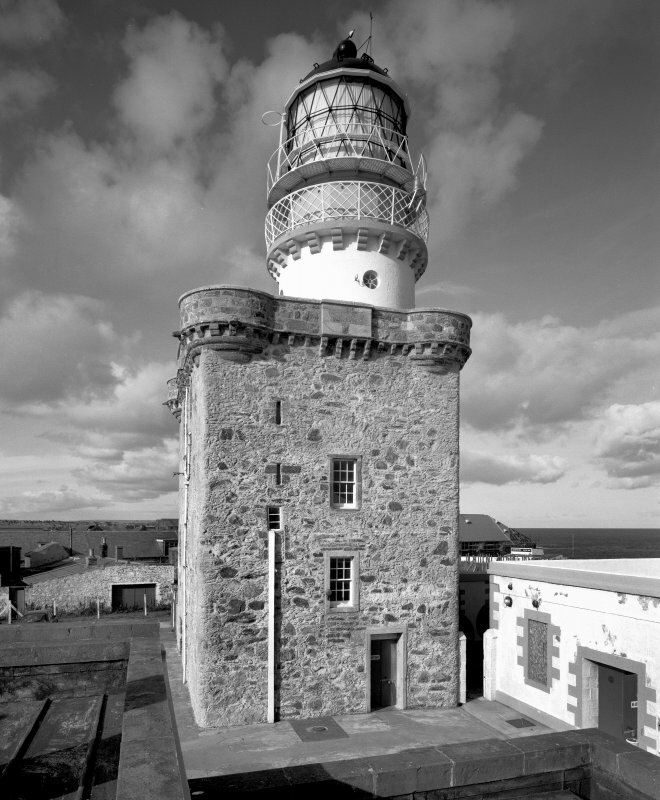 By converting the cap-house of the turnpike stair the engineer Thomas Smith achieved a simple lantern chamber which was first lit on 1 December 1787, thereby becoming the first lighthouse in northern Scotland. Originally the light was fixed, coming from banks of whale-oil lamps each with its own mosaic of mirror glass behind; in clear weather that light could be seen from 12 or 14 miles away. The lantern was rebuilt and upgraded in the 1820s and again in 1851. It now comprises a short circular tower with a domed lantern set with triangular panes of glass. 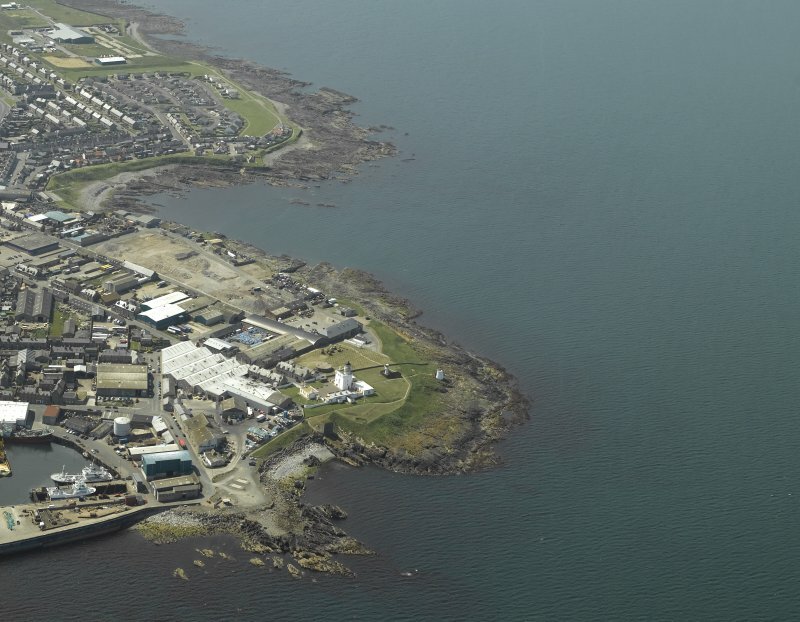 The first permanent radio beacon was established here in 1929, following experiments by Marconi. The usual flat-roofed, white-washed keepers' houses and stores form a small but windy courtyard at the base of the tower. 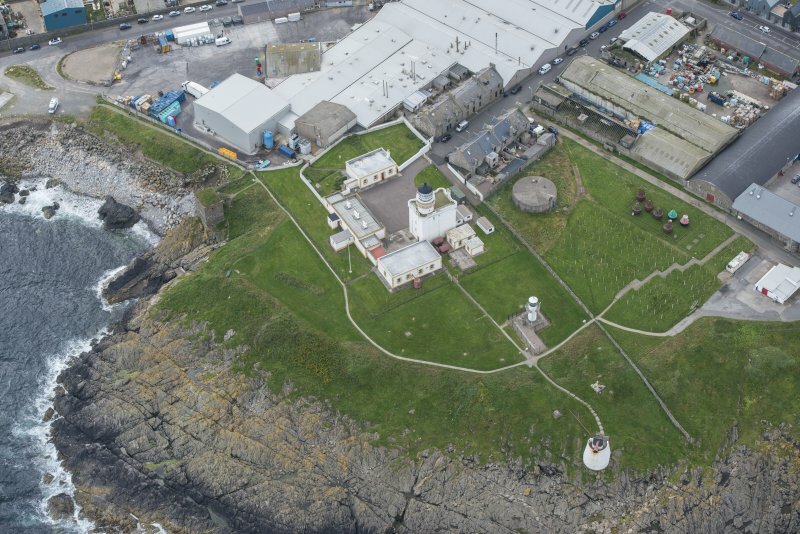 They are part of a new Lighthouse Museum, which tells the story of Scottish seamarking through the history of the Stevenson family, engineers to the Northern Lighthouse Board for 140 years. Above the rocks 100m to the east is another 16th century tower, the Wine Tower. Although now truncated, it contains one chamber with important heraldic bosses which are paralleled at Crathes (no. 22). It appears to have functioned as a private Roman Catholic Chapel. ft thick. The lantern is about 58 ft above ground level and 120 ft above high-water level. installed by Alan Stevenson in 1851. Originally the tower house provided storage accommodation and watch-keeping facilities for the keepers. Additions were made in 1821–30 by Robert Stevenson to provide further accommodation suitable for a ‘national establishment’. The lighthouse now forms part of Scotland’s Lighthouse Museum which contains many unique and fascinating relics of the lighthouse branch of civil engineering. 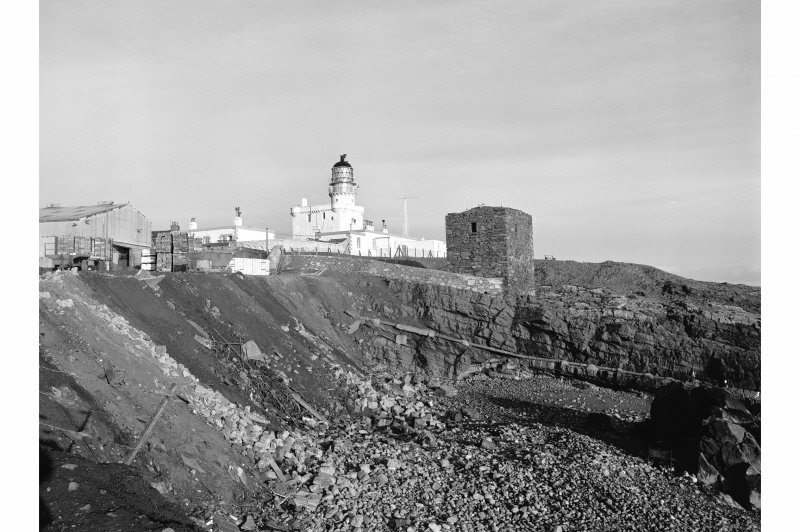 The hazards of the headland north of the port had been recognised when the Northern Lighthouse Board was established in 1786, and the first lighthouse they authorised was built on top of the old castle on Kinnaird Head, and lit on 1 December 1787 (fig 17). In 1830 the light was improved and the surrounding keepers’ accommodation added by Robert Stevenson. Information from ‘The Scottish Burgh Survey, Historic Fraserburgh: Archaeology and Development’, (2010). 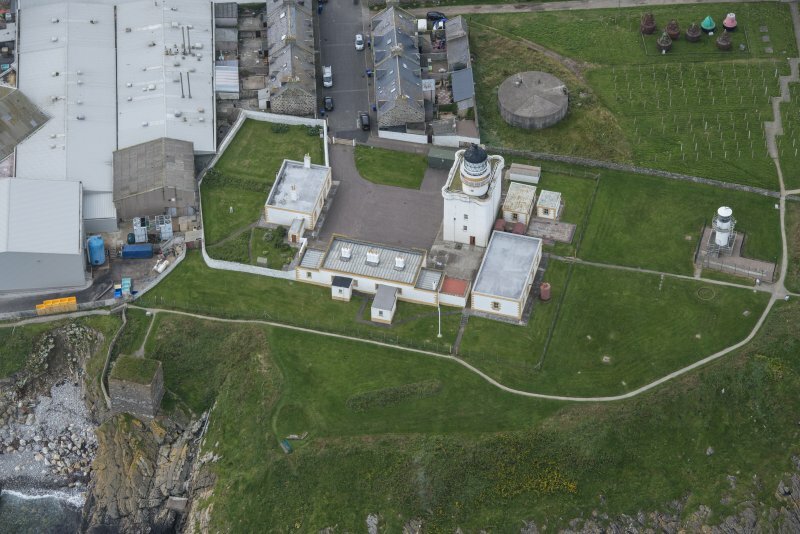 A watching brief was maintained during excavation of trenches ahead of the installation of new signage at Kinnaird Head Castle, Lighthouse and Wine Tower. Five trenches were excavated - four around the grounds of the lighthouse and one next to the Wine Tower. A piece of a prehistoric flint blade was recovered from the trench at NJ 9981 6756, although the ground had been previously disturbed - as shown by the presence of modern pottery within the same context. NJ 9985 6754 A watching brief was maintained on 20 March 2014 during excavations associated with the renewal of corroded water pipes running from the Engine House into generators. There were no finds or features of archaeological significance.